Leading activist fighting European 'settlement' labeling slams 'outrageous' claim by EU Ambassador that 'West Bank' not a part of Israel. At Monday's anti-BDS conference in Jerusalem, EU Ambassador to Israel Lars Faaborg-Andersen justified the EU's decision to label Jewish-made products from Judea and Samaria by insisting that "the West Bank" is not, in fact, a part of Israel, and that therefore such moves against Jews living there are not anti-Israel. 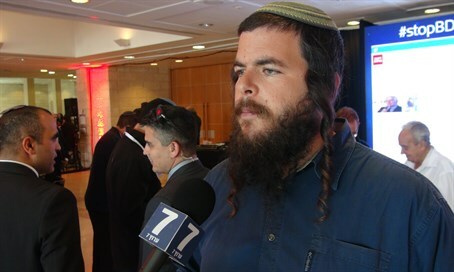 In response, Attorney Nati Rom of the "Lev Haolam" organization - which helps Jewish businesses in Judea and Samaria sell their products worldwide - slammed the "shameful" comments, and delivered a message to the EU envoy. "Judea and Samaria is the heartland of Israel - not only is it in Israel, it is the heartland of Israel."